Cric ket has been played at Weston Colville for well over 100 years, the first reported match being in 1867 when the Weston Colville Thirteen took on Mr.Bullocks Thirteen, with the club winning the two innings match. Many matches have been played since that day and the club now fields two senior weekend teams and has a thriving junior section. The weekend teams play in the Cambridgeshire & Huntingdonshire Cricket League, with the 1st XI in Division 2 of the Cambridgeshire Cricket Association Senior League and the 2nd XI in the Cambridgeshire Cricket Association Junior League. The juniors play at various age groups in the Cambridgeshire Youth Cricket Association League and an U11 team play in the local Borders League. One of the products of the clubs youth policy is Tom Westley, who in addition to being a professional with Essex, has also captained England U19s and Durham University and in 2015/2016 was part of the England Lions squad. The 2017 series against South Africa saw Tom reach the pinnacle of his career with his first full England cap at the Oval. Chris Scott, former Notts & Durham wicketkeeper and now head coach at Cambridge University played for the club up to the end of the 2015 season. Many will remember Ipswich Town winning the FA Cup in 1978. Substitute that day was Mick Lambert, who came from Balsham and was also a fine cricketer who played many times for us. Before he devoted his career to football he spent some time on the staff at Lords where on one occasion he was a substitute fielder in a Test match. We hope that by encouraging and supporting young players as they develop in the game, we will continue to see Weston Colville cricketers take the field for many years to come. Weston Colville is located in the south eastern corner of Cambridgeshire close to the Suffolk and Essex borders. During 2010-2011 the village took part in a project called Sharing Stories, a Heritage Lottery funded project run by Inspire, an organisation that promotes wellbeing through art. 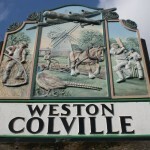 This project saw many villagers interviewed and their experiences of life in the village, including many references to the cricket club, can be found on the Weston Colville Stories website.